Offered as part of national initiatives to advance quality teaching in higher education, CIRTL certificates are an increasingly recognizable credential in today’s competitive academic job market. Participants who have achieved CIRTL Associate status are eligible to apply for a $500 stipend to assist with the material costs of conducting a Teaching as Research project. This stipend can be used to purchase materials or to subsidize further training. CIRTL Associates can also apply for Travel Grants of up to $500 to pursue outside training opportunities in evidence-based teaching. Participants who have been recognized as CIRTL Practitioners are prepared to contribute to the scholarly dialogue concerning evidence-based teaching, and Cornell University is committed to helping Practitioners achieve those goals. CIRTL Practitioners are eligible to apply for Travel Grants of up to $1000 to help present their teaching projects. Additionally, Practitioners can apply to the CIRTL Network Exchange Program for fully supported visits to discuss their research and teaching with scholars at other universities. CIRTL Scholars are models for other future faculty. In addition to Practitioner-level benefits, funding opportunities are available to Scholars who undertake a leadership role within the CIRTL at Cornell Learning Community. CIRTL Scholars who wish to mentor other participants and serve as ambassadors for the CIRTL ideals among their peers are eligible for semester-long appointments conferring a small stipend. CIRTL staff review certificate applications on a quarterly basis. Deadlines for each quarter are January 1, April 1, July 1, and October 1. All applications received on or before that date will be reviewed within two weeks of the end of that quarter. Applicants will be notified via email if their application has been approved or if the application requires further documentation. Certificates and letters of commendation will be mailed to awardees for inclusion in a professional teaching portfolio. 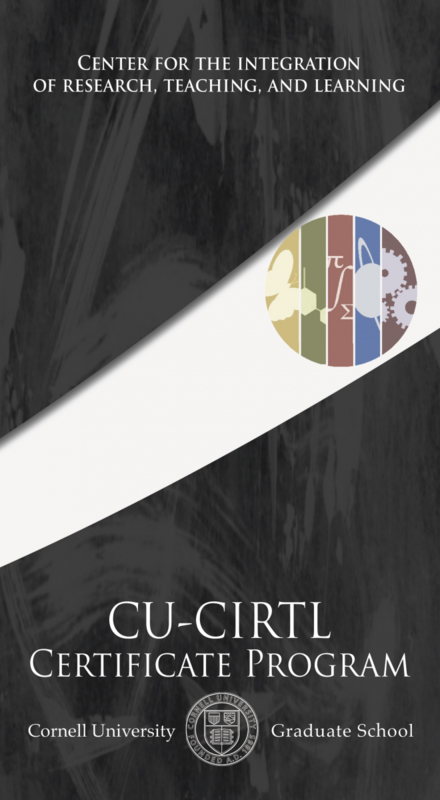 Graduate students and postdocs who would like more information about pursuing a CIRTL Certificate should fill out the Interest Form and members of the CIRTL at Cornell team will help with the application process and next steps.